Hevelius Vodka is based on 600 years of history and tradition of vodka production as well as the knowledge and experience of over 30 generations of polish distillers. 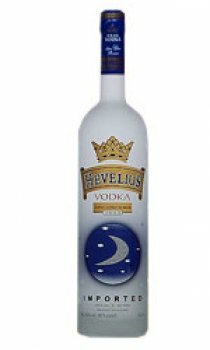 Hevelius' unique taste is attributed to production from the highest quality grain, crystal clear spring water extracted from ancient reserves, the most progressive spirit production techniques and the process of six-fold distillation. In addition to the fantastic taste of this product, Hevelius is packaged in an award winning bottle with an 18.5 carat gold label.